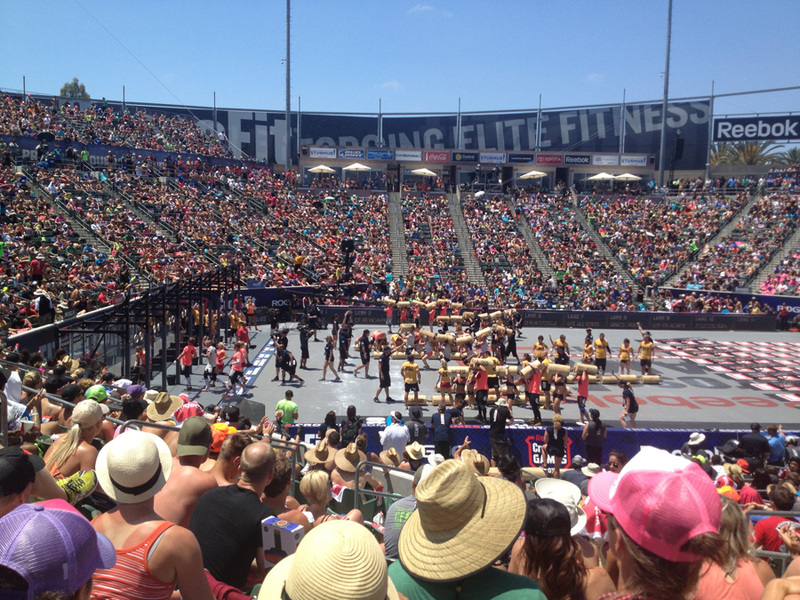 The family traveled to Carson, CA for the CrossFit Games. We watched the individual and team competitions on Friday, Saturday and Sunday. There were, of course, many inspiring stories during the 3 days of competition. Notable among them were Kristen Clever working through a twisted ankle - despite the injury guaranteeing that she would finish out of medal contention. Also, the North East region's small but super-strong Amanda Goodman; she was well out of it by the time the clean and jerk ladder event came around, but she got the crowd roaring with her unbelievable form and huge weight lifted - taking first in that workout. My favorites, surprisingly, were all the team competition. It was inspiring to see the dynamics at work with each team. Part of each workout is the strategy in deciding who does which part of each workout. One team lost a member's right hand in an early workout, but he still competed in the GHD med ball toss - working around his injury to get a few more points for the team. Several workouts required teammates (or the whole team) to execute movements together. Teams had to communicate and observe each other to make sure every member reached a checkpoint at the same time (all in the bottom of a squat, or with weight on the same shoulder). The recurring workout device that showed up three times over the weekend for the teams was the "Worm." This was essentially a 12-foot log cut into 6 2-foot sections and strung together with rope. This ensured that each teammate was bearing part of the load of the log. Dave Castro then had the teams run, squat, deadlift, switch shoulders, and otherwise manipulate the "worm" to complete movements. The final (shown below) included many teams working the "worm" at the same time, close together, and in a complex sequence of lifts and squats. The effect for the fans was an undulating sea of log waves that went up, down, forward, and back in an almost random motion. Lots of work for the athletes, but total chaos from the stands. Going into the games, I was wondering what drew some athletes to compete as a team. Now that I have seen it in person, I can see that the bond of 6 athletes working together, completing workouts that were hard, but fun and creative tests of their abilities would be unforgettable. I would even think that competing as part of a team would be a better experience than struggling as an individual.